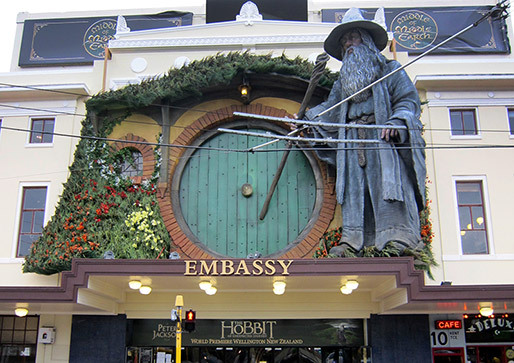 JoJo and I hopped over Cook Strait to Wellington—an easy half hour flight—for a couple of nights to see The Hobbit: An Unexpected Journey at the best place you can see it in Australasia: The Embassy Theatre, where it had its world premiere. It’s the first time we’ve been there together, and Welly did us proud by turning on two days of absolutely atrocious wet and windy weather—but then, Wellington without wind is like Gandalf without his beard! Now that we live ‘in the country’, it’s a strange experience going back to a busy city: fun, but something I am very, very glad to experience occasionally as a treat rather than all the time. Wellington is just big enough to be interesting, and just small enough to not be stressful and difficult, though the damn wind can start doing your head in after a while. 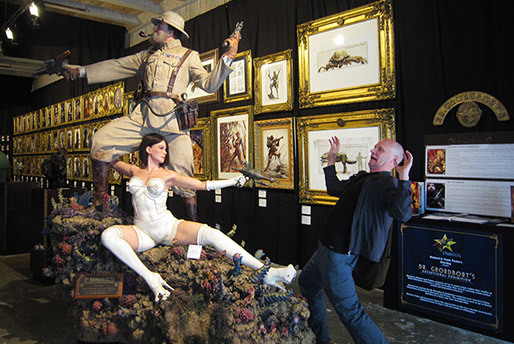 Apart from the film, we packed in a good dose of shopping—mostly for books—and several exhibitions: the Gamemasters videogame and Angels & Aristocrats exhibitions at the excellent Te Papa Museum of New Zealand, and the small but perfectly formed Dr. Grordborts exhibition, featuring the amazing artwork of Weta conceptual designer Greg Broadmore. So how was The Hobbit? Well, for a start I couldn’t be more impressed with The Embassy Theatre, a gorgeous 1920s cinema with beautiful wood and marble fittings, one of the largest screens in the southern hemisphere, and the only place in Australasia fitted out with a new Dolby 360º Atmos sound system (for which The Hobbit’s sound is mixed). With premiere seats (leather seats in the centre of the theatre, name-plated with stars from The Lord of the Rings—I highly recommend G26 and G27, Hugo Weaving and Liv Tyler) and a glass of wine in hand, we were set to see the film the way Peter Jackson surely intended. We weren’t disappointed. Of course, the high definition 48fps is somewhat jarring at first; so realistic and detailed that even the 3D image seems a bit flat and almost TV-like. But I found myself realising that my brain was just being confronted with something that it had hitherto not identified as ‘the look of film’, so had tried to shoehorn it into the definition of TV instead. Of course, it’s completely different from both, and it wasn’t long before I was so immersed in the film that I forgot the somewhat strange feel. And by the end, during one of the climactic scenes, I suddenly realised that this looked absolutely frickin’ amazing, even groundbreaking. We’re definitely in a transition period, and I suppose it won’t be long before films of our generation look like the fuzzy images of the 70s and 80s. What amazes me is how the brain’s visual cortex adapts when confronted with things like higher frame rates and three dimensional film images. It tries first to fit it into its established frames of reference—and eventually, if you can let go a bit, it comes to terms with the fact it is being presented with something new and accepts it. Anyway, this is how I interpreted the experience and I found it fascinating. The film itself delivered all the spectacle you no doubt expect. I think the unique atmosphere of the book is somewhat lost in all the bombastic action scenes, but this is a film, not a book, and as such is just the Peter Jackson-styled adaptation to be enjoyed on its own terms. It’s great fun. The interior of Erebor and the dragon hoard, in particular, was just how I imagined it. My life is very different since I first saw The Lord of the Rings, and I was quite affected by scenes of the beautiful scenery of The Shire, realising that I now lived in the country where it was filmed. A perfect evening was capped off by a couple of glasses of Pegasus Bay Bel Canto Riesling (our favourite NZ wine at the moment), calamari, olives and a cheese board at the bar downstairs: The Black Sparrow. We plan to repeat the entire experience next year for The Hobbit: The Desolation of Smaug!